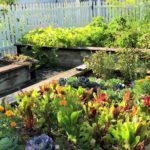 So you got your garden beds all ready and planted all sorts of herbs and vegetables…now what?!? 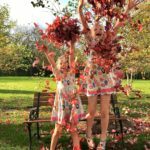 Here are a few, fairly quick things you can do to keep it growing great all season! 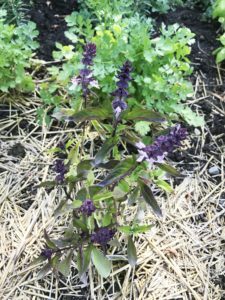 From plenty of water and weeding, to thinning seedlings, to pinching basil flowers and harvesting bolted lettuce. 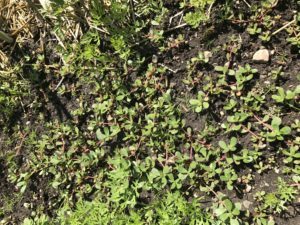 Weeding purslane, aka the most annoying weed ever! Keep on top of your weeding. 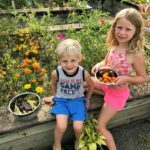 Pop in with the kids a couple times a week and pull any weeds that have popped up before they have a chance to spread or produce flowers/seeds. If you stay on top of it, it should only take 10 minutes here and there. Mulch. 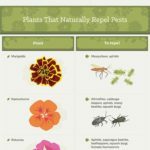 You certainly don’t have to mulch your garden, but it can help prevent weeds (yay!) 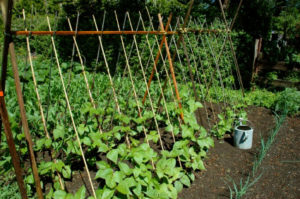 and help the soil retain water on hotter days. 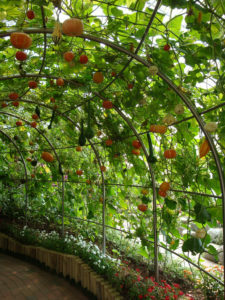 I also use it under seedlings to keep them from being buried in the dirt during heavy rains. I use hay or straw- you can buy it in bales or big bags from the garden center- or you can use grass clippings or shredded leaves. Make sure the hay/straw either doesn’t have seeds or has sat out in the weather so any seeds will have sprouted and died already. If using grass clippings, avoid grass from fertilized lawns. Thin seedlings. 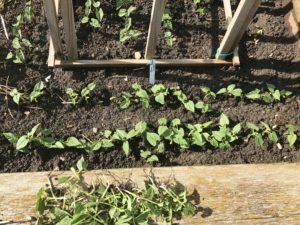 If you’ve planted anything from seed- usually corn, beans, radishes, carrots, beets, etc- make sure to thin out the sprouts to the recommended spacing on the seed packet. 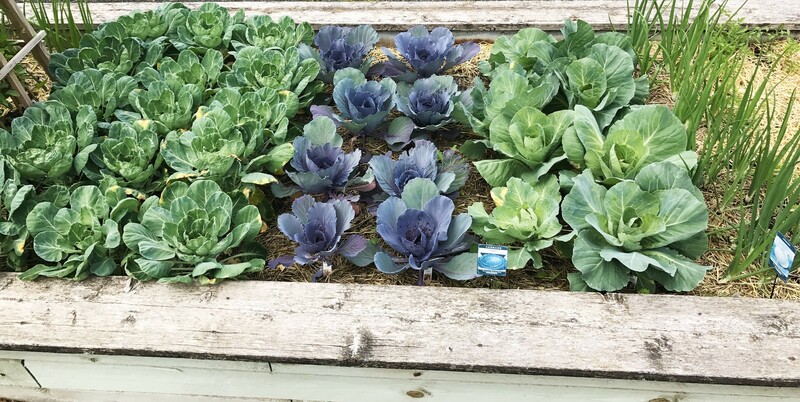 If plants grow too close to each other they compete for root space (root vegetables will not grow properly if too close), sunlight, etc. Either pull them out or clip with a scissors if you’re afraid they’ll disturb the roots of the plant right next to it. Part of me hates doing this simply because I hate pulling all those cute little plants that worked so hard to grow, but you have to. You can thin them all at once or do it when they’re prettty tiny, and then again when they get to be a few inches tall, which is what I did above with our bean plants. Check for pests. Can you believe that something would dare try to eat what you’ve been working so hard to grow?? Unbelievable! Here is a great little cheat sheet on what to look for and what to do about it for now (Click on the picture to the right). I’ll go more into how to deal with pests later this season. 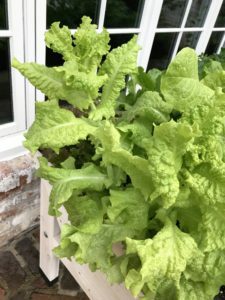 Lettuce- longer and warmer days means your lettuce may start to bolt up to produce flowers and seeds. You have a couple options here. 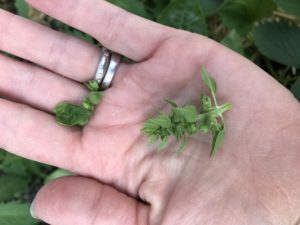 You can 1) harvest all of the leaves on it right away and then pull out the whole plant to make room for something else, or you can 2) let it produce flowers and drop seeds. 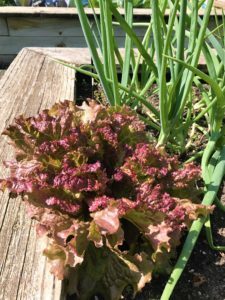 I let a couple lettuce plants bolt in the garden late last year and, to my surprise, I had lettuce plants pop up all on their own this year in parts of that bed, even after tilling. 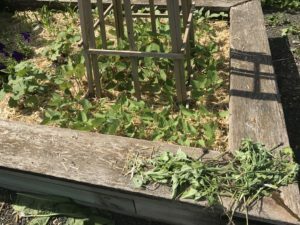 If you decide to harvest the leaves and pull the plant, wash the leaves well and look for any white milky substance on the broken end, as this will mean those leaves have gone bitter. You can store washed leaves in a plastic bag with a damp paper towel in the crisper in your fridge for a week or two. 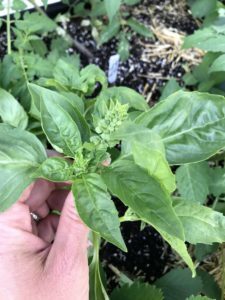 Basil is flowering- if this is happening, simply pinch off the flowers to encourage new leaf growth. 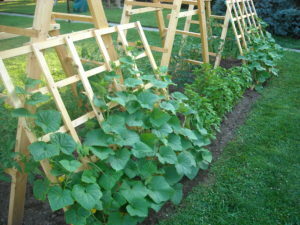 Vine Plants- if you’ve planted things like cucumbers, melons, squash, or pumpkins, don’t be afraid to “train” them. 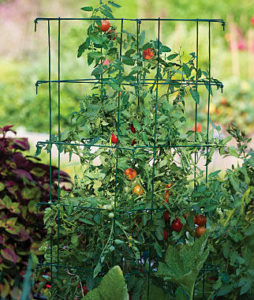 Once the vines start getting longer, direct them where you want them to go (over the side of a garden bed, up a trellis, or over a fence) so they don’t take up too much space. Just make sure you don’t put them in the shade. 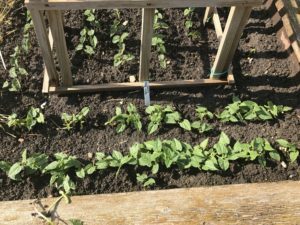 Last year I directed all of my vine plants over the sides of the raised beds and along the gravel rows so we could walk in between them. Some of those butternut squash were growing on vines up to 15ft from the base of the plant! 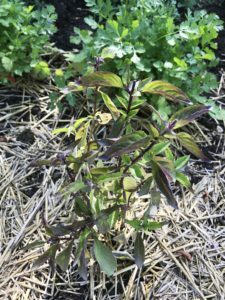 Cut back spreading plants- certain plants like mint and horseradish spread by sending up new shoots from their root system. Don’t be afraid to trim them back to where you want them or they’ll take over the whole garden! Alright, hop to it! 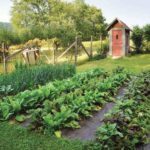 And always remember that gardening is supposed to be fun and rewarding, not stressful. SO have some fun with it.